Add a touch of vintage sparkle to your next project! 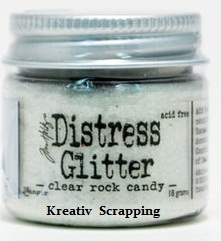 Adhere glitter with Ranger Sticky Embossing Powder; Glossy Accents or other adhesive. This package contains a 1oz jar of glitter. Available in a variety of colors; each sold separately. Acid free and conforms to ASTM D 4236.